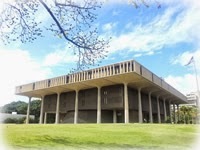 Yesterday kicked off the beginning of Hawaii’s 28th legislative session. Barring a special session, it will end on May 7, 2015, Sine Die (the length of a regular NFLseason). The legislature prides itself on the number of bills it introduces and passes each year. Aside from the many substantive bills introduced by each legislator, many bills are marked “introduced by request,” which ostensibly means the legislator introducing the bill does not necessarily support the bill. Other bills are labeled “short form,” which means that any substantive matter can be inserted in the bill at some point in the legislative process so long as it has some relationship to the bill’s title. This can amount to thousands of proposed bills and resolutions. Many of these bills drop out of the process, are merged with other bills, or are significantly amended or completely replaced. Things begin to gel as we get closer to May and around crossover in mid-February. However, if you are tracking a certain bill and want to be sure it is crafted in a way that makes sense to your business; you will want to be involved throughout the process. Yesterday’s Opening Day remarks by the Senate President and House Speaker give some insight on the priorities for each chamber. The following is a summary of their land use related priorities. Opening day remarks can be found in full at http://www.capitol.hawaii.gov/speeches/2015opening.aspx, including remarks by Senate Minority Floor Leader Sam Slom and House Majority Leader Scott Saiki.